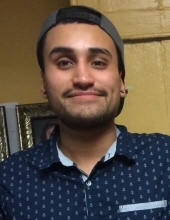 Christian Zavaleta, 23, of Coatesville died Saturday, September 29, 2018. Born in Dallas, TX, he was the son of Rey and Maria Ezquivel Zavaleta. In addition to his parents, Christian is survived by his siblings: Brandon, Paola, and Dylan and many aunts, uncles, cousins and friends. Christian's family and friends are invited to visitation at Wentz Funeral Home Friday, October 5, 2018 from 4-8pm. Christian's funeral mass will be celebrated Saturday, October 6, 2018 at 11am at St. Joseph Church 404 Charles Street, Coatesville. There will be visitation at church beginning at 10am. Interment will be in St. Agnes Cemetery, West Chester. To send flowers or a remembrance gift to the family of Christian Zavaleta, please visit our Tribute Store. "Email Address" would like to share the life celebration of Christian Zavaleta. Click on the "link" to go to share a favorite memory or leave a condolence message for the family.